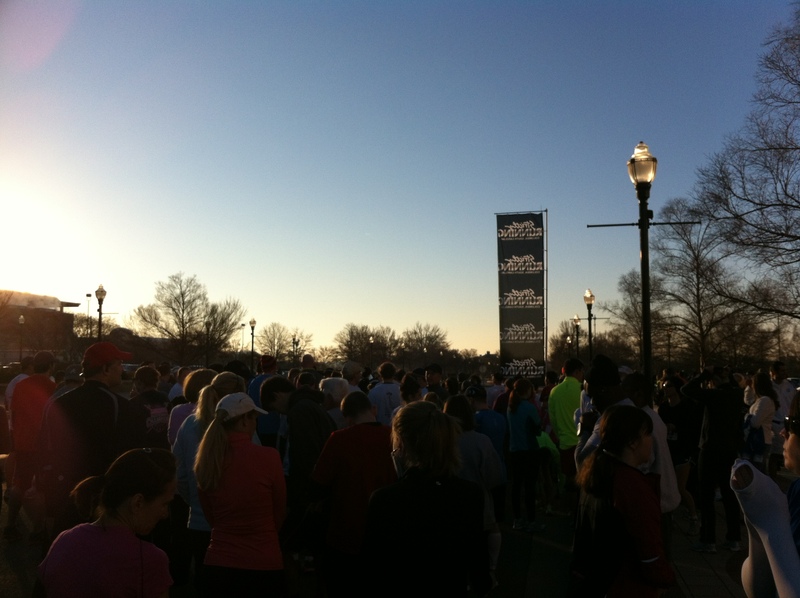 The last time I ran in a running race was at least 1.5 years ago, perhaps longer. That was when I was hurt and not enjoying it, which explains my time away. Lately I have been getting back in the swing of things, mostly on the treadmill, and wanted to see how I would do on the road. Needless to say, I was a little nervous. I also had no idea what to wear. It was cold and sunny at the start, in the low 40s, so I figured I should layer and cover my arms and legs. That was a problem because somehow I have no cold weather running clothes. I tried out my cycling knee warmers. That wasn’t happening without bike shorts. Even the leg warmers wouldn’t hold. Instead I decided to brave the elements with basketball shorts, a long-sleeve base layer shirt and a regular t-shirt on top. It turned out not to matter. Once I hit the pavement, my body warmed itself and I never worried about the cold. The event was the 6th Annual Red Nose Run, put on by Strictly Running. There were two race options, a 10k and a 5k. At first I considered trying the 10k, having just completed an 8k the week prior. I wisely decided to start small with the 5k. I wasn’t thinking of speed, although in the back of my mind I hoped to break 30 minutes. My plan was just to get going, find a comfortable pace and stay there. That pace turned out to be 6 mph. I held it steady most of the way, keeping my breath controlled and trying to ignore my weak legs. The first mile had some hills, which I trotted through without incident. The second mile was mostly flat, and fortunately the third mile had some descents. I grunted my way through without stopping. The finish line was at the Colonial Center, hard to miss. When I saw it in the distance, my legs got a little antsy. My GPS said I was at about 28 minutes and there was a slight downhill the rest of the way. I went a little harder for that last quarter of a mile and barely broke 30 minutes. According to my GPS, I was at 29:48. As a cyclist with weak calves, I’ll take it. The official results have me at 30 minutes and a few seconds, but I am going with own timer, thank you very much. Speaking of calves, they were pretty sore. The pavement is a lot more punishing than a treadmill. I ate some protein and sucked it up because a couple hours later I would be gearing up for a group ride. Fortunately our ride was slow. It was a 32-mile social ride with some good friends I hadn’t seen in awhile. I rode from the house to get a few extra miles, but not much faster. In total it turned out to be almost 55 miles at a 15mph average, slow for me. There were a couple highlights, such as sprinting on a fast stretch at a 35mph clip. Most importantly it was a fun, easy ride, just what I needed. Oddly enough, this morning I woke up with a workout hangover. This is the most sore I have been for a long while, including the challenging mountain trips I made a couple weeks ago. That probably has more to do with the running, since it works different and underused muscle groups. It’s all good for me and I plan to continue the cross-training throughout the year. This entry was posted on Sunday, January 29th, 2012 at 11:06 am	and tagged with columbia, cross training, cycling, group ride, red nose run, running and posted in Running. You can follow any responses to this entry through the RSS 2.0 feed. « Cross-Trained and Blowing it Up! I find running (when I do it) a painful chore. Cycling, on the other hand, lets you have a great work out, and you can enjoy the countryside and chat with your mates. It’s a no-brainer, really. Same here. I am not a big fan of running. It is a lot more punishing and painful. But I’ve been doing it just to improve my cycling, which has helped quite a bit.